What is Collections in Verse? Collections in Verse is an Arts Council England funded collaboration between the British Library and us, Poet in the City, designed to bring British Library (BL) exhibitions alive for audiences across the country and to help raise the profile of public libraries as homes for poetry and the performing arts. We will be using live poetry events and commissions to animate BL exhibitions in locally specific ways where physical touring of collections isn’t possible. What does being national really mean? Exhibitions in national museums and libraries are meant to be just that, national. We don’t want to let the fixed physicality of collections get in the way of people all over the country experiencing them, contributing to them and building a connection to the content – and we think that this project is a really exciting solution to this. We are also hoping to challenge the idea of a ‘tour’, where the same thing is repeated in different areas. We want to use the diversity and flexibility of poets and poetry events to shape something radically different and relevant to each area. Guided by what local communities are interested in, local poets will interpret and create poetry inspired by the exhibitions, and we will collaborate with them to create ambitious events to engage new and existing audiences. The result might take the form of ‘late’ style takeovers of central and branch libraries on the exhibition themes, or poetry busking, poetry parties in houses and ice-cream vans to bring libraries and exhibitions out into other community spaces. Really importantly, the process is equally critical to the ‘end product’. Our ability to connect with audiences in an on-going and sustained way will determine the success of the project – but more on that below. What does a ‘non-physical tour’ of an exhibition look like? 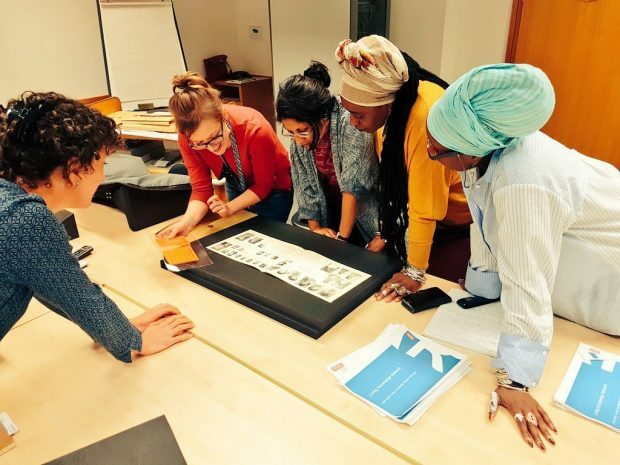 If we imagine an exhibition as a display of objects or documents curated to tell a story, a non-physical version of this will bring to life the stories portrayed by the objects using the narrative created by the curators. Take an exhibition on maps which moves through three geographical regions – a live version of this might use three rooms to represent the different geographical regions, and in each room audiences might experience poetry performances inspired by the objects or documents. The participating cities and libraries are also all part of the BL’s Living Knowledge Network – a fantastic collaborative network of national and public libraries across the UK dedicated to sharing knowledge, skills and collections. We are really excited to be able to tap into this group of forward-thinking libraries – it is a great opportunity to scale an idea quickly and effectively, and for our programme to have an impact in many places. The fact that the BL is developing a relationship with each library service also really paves the way for creating sustainable programmes, and a legacy not just for us, but for a whole new way of working for the libraries, audiences and artists involved. Why is co-creation with local audiences important? At the heart of this project is our desire to hand over the programming and commissioning reins to local audiences in the cities we’ll be touring to, to ensure that their voices and stories are at the forefront of the work created. We know that public library audiences are some of the most diverse in the cultural sector, so working through libraries creates a unique opportunity for this work to be experienced by those who might not be attending other cultural venues. To be relevant and engaging, and to make sure people come, we need local audiences to advise and lead us; the only way we can successfully introduce something new is for local people to advocate for the project, for it to be theirs. The artists we commission will work really closely with local audiences to incorporate their perspectives on national narratives told within exhibitions. For example Windrush is the first exhibition we’re touring, and experiences of Windrush won’t be the same in Leeds as they are in Reading, so we want the work to reflect this. What are our hopes for the project? We’d like to be able to demonstrate that this approach could massively increase the accessibility of London exhibitions and further embed poetry as an artform that more people can experience and be inspired by. We hope to have a lasting impact on the cities we work with and to begin long and fruitful collaborations, which extend beyond our initial commissions. We’ve just started our first commission in Leeds, and over the next 3 years will be heading to Sheffield, Newcastle, Reading and Exeter. This is our first blog post and we’re looking forward to writing again after our commissions start to take shape so we can share what is being created. Through ambitious live events and commissions, we provide a space for audiences to experience classic and contemporary poetry, creating imaginative poetry worlds within which to explore society and history. In addition to the work we produce ourselves, we are also training the next generation of poetry producers to secure the future of live poetry, providing employability skills while giving access to our platforms and resources to express their ideas. You can find our work in major arts venues including the Barbican, Kings Place and the British Museum, and everyday community and heritage spaces including hotels and train stations. We collaborate with audiences every step of the way to ensure their voices are front and centre and that our programming is relevant and socially engaged. 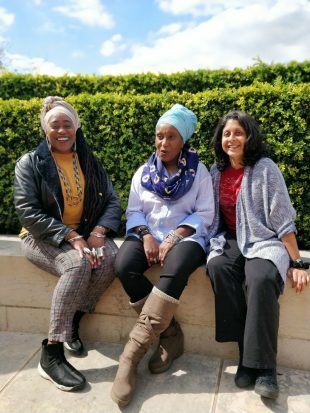 This approach is making use of poetry's connective power to bring together engaged and disenfranchised communities, giving them an equal stake in the stories of today. Poet in the City is an Arts Council England National Portfolio Organisation. You can find out more about Poet in the City and the Living Knowledge Network here: @PoetinthecityUK and @BL_LivingKnow.